Sesame seed oil is a semi-dry oil that is easily absorbed. It is often used in aromatherapy and massage. It is also traditionally used in Ayurvedic medicine, where it is thought to reduce stress and pacify the nervous system. Amour Natural`s sesame seed oil is rich in fatty acids including linoleic acid and oleic acid, as well as many vitamins and minerals such as vitamin E, magnesium, copper, calcium, iron and zinc. 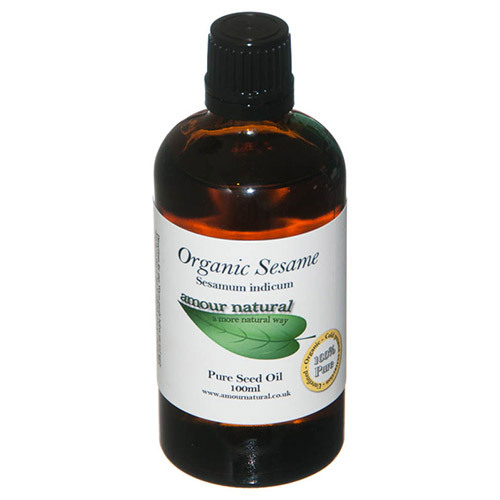 Massaging sesame seed oil into the skin is a great way to benefit from its therapeutic properties. Sesame seed oil is often used to relieve lethargy and fatigue, whilst promoting strength and energy and increasing circulation. Amour Natural’s sesame seed oil has been deodorised using steam to reduce it’s natural odour and make it more neutral for use with essential oils and for body care. 100% pure organic Sesame seed oil. Warm gently before use and apply directly on skin or hair to nourish, calm and strengthen. Mix with other oils for a massage blend. Can be used as an ingredient to make your own hair, body and face products. Below are reviews of Amour Natural Organic Sesame Pure Seed Oil - 100ml by bodykind customers. If you have tried this product we'd love to hear what you think so please leave a review.